Louisiana has a broken death-penalty system. It’s arbitrary, vengeful and inordinately expensive in a state with dire fiscal needs. It embodies a sordid history of racism and is shamed by one of the highest rates of reversal and exoneration in the country. I am excited that a local organization, LA REPEAL, a project of the Promise of Justice Initiative, is bringing together a strong coalition of churches, other faith communities, and civil rights advocates to repeal capital punishment in Louisiana. They hope to end the legal “relic” of taking a life in order, typically, to avenge the crime of taking a life. As a longtime opponent of the death penalty, I believe LA REPEAL represents the best prospect for abolishing the death penalty that I have seen. I hope readers of the Lens will swing into full support for this reform even before the bill comes up in the state legislature, as promised, later this year. Suddenly he was gone. My friend had had enough of Death Row. He hanged himself. That means writing, emailing or calling our state representatives. You will be in good company! Sister Helen Prejean, author of the culture-changing book, “Dead Man Walking,” later made into a movie, is part of the LA REPEAL Leadership Council. So is Bill Quigley, one of the strongest civil rights lawyers in the nation. 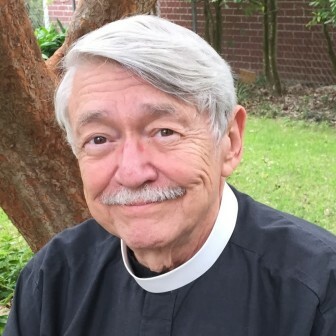 So is Episcopal Bishop Joe Doss, a decades-long activist against the death penalty. And so is Calvin Duncan, who spent nearly 30 years as an inmate at Angola for a crime that he did not commit. My deep opposition to the death penalty was buttressed recently by a tragedy. Most every month for four years I had been driving to Angola to visit an inmate awaiting execution. Suddenly he was gone. My friend had had enough of Death Row. He hanged himself. I had chosen not to ask what Tyrone, as I’ll call him, had done to get himself convicted of a capital crime. I was not there as a judge. I was there to offer what help I could as he sought spiritual rehabilitation. What was obvious to me and to Tyrone’s family and friends was how much his life had changed. Scriptural study and the passage of time had opened his heart. Sullenness and fear had given way to repentance. But the isolation and hopelessness of life on the Row had thrown him into despair. At his home-going (funeral) in a small Central Louisiana town, friends and family members spoke of their love for Tyrone and how he sought their forgiveness for his crime. I was able to testify to how much my monthly visits had meant to me and, I hoped, to Tyrone as well. I may be a clergyman, but I think I learned as much from Tyrone as he learned from me. On occasion, I have quoted him in my sermons—protecting his identity, of course. I learned from Tyrone just how much any of us can change. The lesson was reinforced during my many years serving as a volunteer at Angola in the Kairos Prison Ministry International. When volunteers take part in the Kairos three-plus days in-prison retreats, they do their best to carry out the Kairos mantra—“Listen, listen, love, love”—as they relate to the inmates (“residents,” as some prefer to be called). Those who have done the worst can and do change. Many take responsibility for their crimes and seek ways to ask forgiveness from those they have deeply hurt. That life-altering power to change is my first reason for opposing the death penalty. My second reason: Those on Death Row at Angola are doomed to life-long solitary confinement. They are let out of their small cells only to enter a larger cage for one or two hours a day. As a result of this treatment, many of the men go crazy, become impossibly hostile, or curl-up-in-a-corner, defeated, bored, beyond reach of rehabilitation. Imagine how many more stories of redemption there might be if instead we treated those on Death Row humanely. Imagine how much better off we’d be if the money wasted on the death penalty were spent instead on preventing crime more effectively and rehabilitating prisoners and their victims. Third, the cost of condemning inmates to Death Row is, as LA REPEAL attests, immense. One recent Louisiana case involving five co-defendants cost $15 million, and yielded only two death sentences, both of which are under appeal. LA REPEAL calculates that over the past 10 years, the death penalty in Louisiana has cost taxpayers $155 million. At this writing, tax payers are footing the bill for 67 men on Death Row at Angola, 73 percent of whom are African American or Hispanic. The one woman on Death Row in the Louisiana Correctional Institute at St. Gabriel is black. If these same brothers and sisters were in one of the other Angola prison camps, they would have an opportunity to work, “earning their keep” or at least paying for some of it. In solitary, they do nothing and earn nothing. Imagine how much better off we’d be if the money wasted on the death penalty were spent instead on preventing crime more effectively and rehabilitating prisoners and their victims. My fourth reason for opposing the death penalty: Every day of their lives, those on the Row face sudden notification that their execution date has been set. It is hard enough to face death from an illness, but think about what happens to those scheduled to be killed by the state. There is no one in the last weeks or months to hold your hand, to thank you for what you have tried to give them, to pray with you. Special family members can be with you on that last day, but it is always a day of “fear and trembling” as you become the dead man walking. The possibility that the “execution date” could be set any day terrified Tyrone and, I believe, contributed to his hanging himself. My fifth reason for opposing the death penalty is that it does not serve as a deterrent. Despite myths to the contrary, it does not stop others from taking a life. The National Institute of Justice, the research arm of the federal Department of Justice, confirms this. (See also “Deterrence and the Death Penalty,” edited by Daniel S. Nagin and John V. Pepper.) The National Institute of Justice study is backed by a poll of nationwide police chiefs on ways to reduce violent crime; they ranked the death penalty last— the least effective approach. Common sense leads to the same obvious conclusion. Who among those planning a murder will hold back, thinking that if they are caught, it would be much better to spend their days locked up for life than to be executed? Finally, I am opposed to the death penalty because I care about victims’ families. I think it is absolutely necessary to support the families of crime victims as much as we are able. I learned this long ago as a member of the clergy at Trinity Episcopal in New Orleans. The teenage son of one of our active church members had been murdered. Horrified as we all were by the death of that young man, I nonetheless spoke out against the death penalty. The young man’s loving father was furious with me. I had neglected him and his family members, he charged, adding that I only wanted to be politically correct. He was right about the neglect but not about the reasons for my opposition to the death penalty. From then on, I promised the father and myself that any time I spoke out against the death penalty, I would also speak up for, and support as I could, the families of the victims. As many discover — whether or not they want a defendant sentenced to death — the protracted death penalty process only adds to their suffering. The automatic appeals, the inevitable delays and the years of uncertainty are a sentence the victims’ families must also endure! What’s more, with the publicity surrounding death penalty cases, the renewed attention that comes with every appeal or ruling in the judicial process rips open wounds. The victims’ families struggle to heal when they are ensnared in a seemingly never-ending legal process. Nowadays the death penalty is inadmissible, no matter how serious the crime committed. It is an offense against the individuality of life and the dignity of the human person, which contradicts God’s plans for man and society and his merciful justice, and impedes the penalty from fulfilling any just objective. It does not render justice in the victims, but rather vengeance. One does not have to be a Catholic or even a person of faith to embrace what the Pope is preaching. As we strive to change our laws, thank you, Pope Francis, for your insights and the strength of your determination to end this barbaric practice. LA REPEAL is working with numerous groups and individuals to lobby every Louisiana legislator, to write op-eds for various newspapers, to circulate petitions, and to hold interfaith meetings. Visit the LA REPEAL website to keep up with this work and, in particular, to find out when the anti-death penalty bill will be brought up in committee. I believe that together, we can work to end Louisiana’s broken and outdated death penalty. The opinion section is a community forum. Views expressed are not necessarily those of The Lens or its staff. To propose an idea for a column, contact Lens founder Karen Gadbois. In late February, Seattle-area U.S. Rep. Pramila Jayapal, introduced a “Medicare for All” bill in Congress that immediately attracted more than 100 Democratic co-sponsors. The legislation, if passed, would provide comprehensive healthcare coverage — medical, dental, prescriptions, long-term care, mental health, and more — to every resident in the United States, with no copays, premiums, or deductibles.